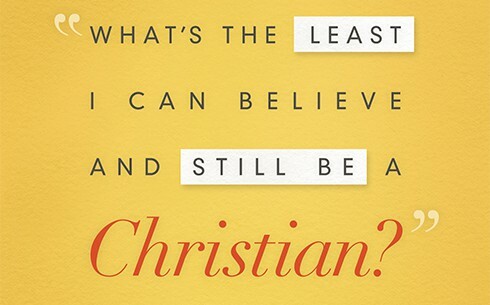 Starting in April 2015, for seven weeks, I’ll be teaching a class based (loosely) on Martin Theilen’s What’s the Least I Can Believe and Still be a Christian? at Springhouse Worship & Arts Center. The class is designed to cut through the clutter and excess focus on non-essentials and renew our faith with clear focus on the essentials. To sum up the Trinity (which is what parts 1 through 3 were about) consider this great, succinct video explanation by Ravi Zacharias, the great apologist. Notice how he deals with complexity and continues using reason and philosophy. That the Trinity is uncovered in the Bible is theology. Trying to understand the Trinity is an exercise in logic and philosophy. On the unforgiveable sin, see Hank Hanegraaff’s short video response from the One Minute Apologist webcast. For a great video on the differences between Calvinism and Arminianism, check out this sermon clip by former head pastor of Mars Hill, Mark Driscoll. For a constructive conversation between John Piper (Calvinist) and Rick Warren (Arminian) over the complete sovereignty of God, suffering, sin, and how God is in control of everything, watch this clip. They also discuss Unconditional Election – God chooses who will be saved – and also Conditional Election in this clip, which coincidentally is where I tend to find myself on this topic, if that matters. “Any apparent contradiction in scripture is my limited capacity… it’s like an ant trying to understand the internet.” – Warren. An interesting apologetics class by R.C. Sproul touches on the Deity of Christ. Move forward to the 14 minute mark of this video. Pastor Mark Discholl has a great video clip on Jesus’ claims to be God and why he was arrested and killed. Some perspectives on tongues and other Gifts of the Spirit: John Piper on What is the Gift of Tongues? He is fully vulnerable on his own experiences. Mark Driscoll on Common questions about the Gift of Tongues. The whole sermon can be found here on the topic of Empowered by the Spirit to Follow Jesus. While Driscoll (like Piper) is Reformed, he is also open to the gifts being ongoing. From John MacArthur’s Strange Fire Conference (Cessationalist), Nathan Busenitz, assistant to John MacArthur and professor at The Master’s Seminary, teaches on Charismatic Counterfeits: Do the Modern Gifts Meet the Biblical Standard? in this clip. You can also find quite a bit more on the Strange Fire Conference, which was basically a Cessationalist Conference. For John MacArthur’s own views, which are very strong, watch a sermon here. For a clear explanation of how to discuss and not divide over the Gifts of the Spirit from an apologist who is not Charismatic, Hank Hanegraaff of the Christian Research Institute, listen to this video here. Week 1 non-essential: Evolution, essential: the Nature of God. Pastors Matt Chandler of Village Church in Dallas-Fort Worth, Tim Keller of Redeemer Presbyterian Church in New York City, and Professor of Theology and Apologetics at Westminster Seminary California Michael Horton discuss how to disagree and not divide in this short discussion clip. A great primer for the central concept of this class: disagreeing agreeably. Can Science Disprove God? is a short video clip with Frank Turek on the One Minute Apologist webcast. Links to the ministries named in the Creation, ID and Evolution discussion: Biologos (Christian Evolution), Ken Hamm’s Answers in Genesis (Young Earth), Reasons to Believe (Intelligent Design). Who Needs Christ During Christmas? Christmas is actually better without the Christ… we are speculating that for a large majority of Christians, especially the Christians that only go to church on Christmas and Easter because they have to… the religion is not the best part of Christmas. In fact it’s not even a good part of Christmas. All of the fun parts of Christmas… not only predate Christianity, but they are also completely devoid of religion. I find a lot I can agreed with in what Mr. Silverman said. For instance, I agree that for many people, especially those who only go to church a couple times a year and who feel like they “have to” go to church at Christmas, the religious aspects of Christmas really aren’t that much fun. I believe they aren’t fun because I believe that a person who checks the box, so to speak, by attending on Christmas and Easter, and who doesn’t regularly congregate with other believers to grow in their faith may not actually be a Christian when defined as “Christ follower.” After all, in the most basic terms, Jesus enjoyed going to church every week and he and his apostles encouraged believers to do the same thing. It then follows that if a Christmas celebrant isn’t actually a “Christian” then they probably don’t mind the unabashed commercialism and greed that, for so many in modern America, Christmas has come to represent. And if that’s the case, then Christmas is absolutely more fun without God, Christ and church. So, by his definitions, Mr. Silverman may be right. After watching this video and thinking about what Christmas means I’m left with one defining question I think I, as someone who calls myself a “Christian,” should ask myself: Do I look forward to and enjoy the non-religious parts of Christmas more than the religious parts? If so I may have a problem. A passage to ponder: 2 Corinthians 4:4. Satan, who is the god of this world, has blinded the minds of those who don’t believe. They are unable to see the glorious light of the Good News. They don’t understand this message about the glory of Christ, who is the exact likeness of God. This term at Springhouse Worship & Arts Center, I’m teaching Has God Spoken? a class on how to interpret the Bible correctly and also how we know we can trust the Bible. 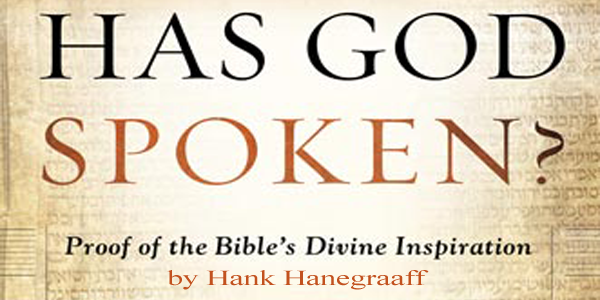 In week 7 we work through a recap of this 7 week study of interpreting the Bible from Hank Hanegraaff’s Has God Spoken? If you have trouble streaming the audio, then right-click it and download the MP3. Contact me if you can’t get the audio to work and I’ll send it to you. Has God Spoken w7 audio. Has God Spoken w7 worksheet (PowerPoint). In week 6 we work through the Synergy Principle of interpreting the Bible from Hank Hanegraaff’s Has God Spoken? Has God Spoken w6 audio. Has God Spoken w6 worksheet (PowerPoint). In week 5 we work through the Historical Principle of interpreting the Bible from Hank Hanegraaff’s Has God Spoken? Has God Spoken w5 audio. Has God Spoken w5 worksheet (PowerPoint). In week 4 we work through the Grammatical Principle of interpreting the Bible from Hank Hanegraaff’s Has God Spoken? Has God Spoken w4 audio. Has God Spoken w4 worksheet (PowerPoint). In week 3 we work through the Literal Principle of interpreting the Bible from Hank Hanegraaff’s Has God Spoken? Has God Spoken w3 audio. Has God Spoken w3 worksheet. Week 2 starts in on the text at hand, Hank Hanegraaff’s Has God Spoken?, on the topic of Manuscript Copyists. Has God Spoken w2 audio. Has God Spoken w2 worksheet.